The weekend before last, I found myself in Miami for the evening taking care of some business related items on my to do list. 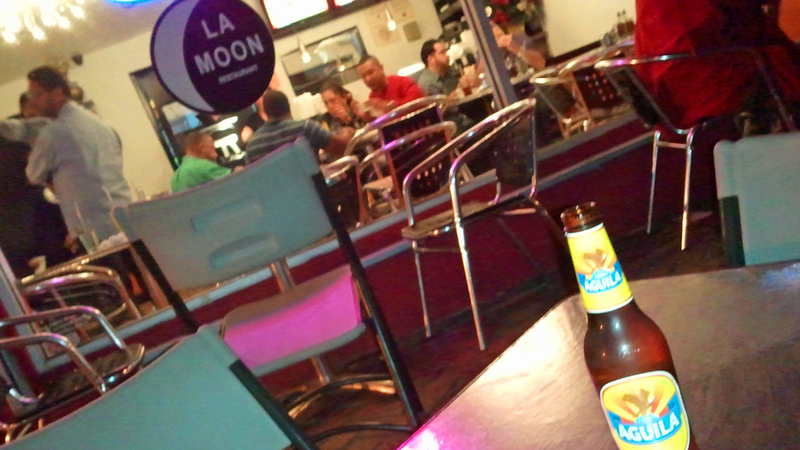 Since I was in town and had some time to spare, I decided to track down another Man v. Food location in Miami: La Moon. The Supermoon Perro is a Colombian style hot dog topped with bacon, potato strips, 5 different sauces, and a quail egg. You read that right, folks: that white thing in the photo on top of the hot dog is a quail egg. Overall, the hot dog was tangy and worthy of a MvF mention. The atmosphere, though, is what makes La Moon worth the stop. It has that Miami ambiance that you read about but rarely truly experience. For the prices and the value of food, odds are that I’ll swing by again in the future if only to take some friends to experience a colorful piece of South Florida.